Practically on the day the existence of the Kliper project was revealed to the public, Russian officials admitted that despite its pragmatic and cost-conscious design, the new orbiter had little chance getting off the ground without financial backing from abroad. No surprisingly, the Russian Space Agency, Roskosmos, and RKK Energia launched an aggressive marketing effort to sell the Kliper to international partners. However, they had little room to shop around. In the course of the project, RKK Energia developed good contacts with EADS, Europe's major aerospace conglomerate. The Jules Verne, however, had a major drawback -- no ability to return cargo back from the station  a feature which became critically important, as Space Shuttles retirement loomed around 2010. As a result, Europeans who invested more than two decades of work and millions of dollars, building yet-to-be-launched scientific lab for the station looked for a reliable two-way supply line to the ISS. Here, in the middle of 2004 conveniently came a Russian proposal for the cooperation on the Kliper. Initially, ESA was interested in the unmanned wingless orbiter, which would be launched on top of the European Ariane 5 rocket, however Russians insisted on a full-scale piloted vehicle. ESA asked the EADS consortium to study Russian proposals and a number of high-level meetings between two agencies also discussed the idea. In February 2005, the Russian-European working group on the Kliper project met for the first time. RKK Energia presented its proposals on the development of the manned winged version of the Kliper. The combined group developed a proposal on the cooperation, which was then presented to the European Space Agency. After the consideration at the top of ESA, the next meeting between Russian and European officials took place in April 2005, where ESA expressed interest in the manned orbiter, leaving a cargo version as an extra option. These efforts resulted in the meetings of heads of agencies in Moscow at the beginning of June 2005 and continued at the Paris Air Show in Le Bourget the same month. By that time likely options for the participation of each side in the project were drafted. Around the same time, Daniel Sacotte, the Director of Manned Space Programs of the European Space Agency, ESA, visiting RKK Energia said that Council of Ministers of the ESA members decided to consider the issue of funding of the Kliper spacecraft during its meeting in December of 2005. Nikolai Moiseev, Deputy Chief of Russian Space Agency, Roskosmos, was quoted as saying that the Kliper system would be adapted for launches from Russian facilities, as well as from the European space port in Kourou, French Guiana. According to Russian space officials, with the European support, the Kliper could fly "no later than" 2011 rather than "after 2012" launch date quoted previously. By June 2004, according to the people involved in the project, it was no longer a question whether Europe will participate in the Kliper project, but rather what particular contribution in hardware and expertise, the European partners would provide. 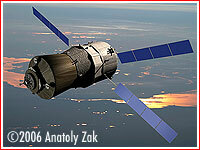 Europe was likely to participate in the development of the spacecraft's crew module and onboard avionics. In the fall of 2005, Russian space agency officials and leadership of RKK Energia visited Japan for talks on possible Japanese contribution into the Kliper program. On November 28, 2005, European Space Agency released details of the agenda for a highly anticipated "space summit" scheduled for December 5 and 6, 2005 in Berlin. The Ministers in charge of space activities within the 17 Member States of the European Space Agency (ESA) and Canada were expected to approve or reject a broad array of space projects, including the so-called "Clipper Preparatory Programme." The official ESA statement preceding the meeting said that the Kliper would give Europe access to space at a much lower cost than an autonomous route. According to the ESA announcement, "an in-depth investigation of the content and modalities of such cooperation will be performed in a two-year (2006/2007) Clipper Preparatory Programme, with a view to preparing a decision on a joint development and future operations preparation programme at the Council meeting at Ministerial level in 2008. This phase will identify the mission and system requirements, establish a preliminary design, initiate technology demonstration, define the respective roles, responsibilities and rights of the partners, identify and quantify the cost and schedule for European participation and prepare the formal arrangements necessary for such a joint undertaking. The Japan Aerospace Exploration Agency (JAXA) has expressed a wish to join ESA in this cooperation, with Roskosmos and other entities of the Russian Federation as may be required." A proposed budget for the European Space Agency called for 0.8 Billion Euro to be split between ExoMars spacecraft and the Clipper Preparatory Programme during 2006 and 2007. On the eve of the meeting, Russian and European press was full of glowing reports predicting an easy approval of Europe's involvement into the Kliper. This optimism only made more acute the shock from the announcement that the majority of key players in the agency rejected the project. In the wake of the meeting, on Dec. 9, 2005, ESA Director General Jean-Jacques Dordain visited Moscow, where he met Anatoly Perminov, Director General at Roskosmos. After the meeting, Dordain told Moscow press that ESA would reinitiate new consultations in Europe on the issue of the Kliper in February 2006, and he promised a decision by June of the same year. He reiterated that it would be vital for Europe to have a stake in space transport if the continent wanted to be a player in future exploration. After several months of uncertainty, a new concept for Russian-European cooperation had been conceived around the spring of 2006. This time, two sides considered combining funds, hardware and expertise to parallel the US effort to return to the Moon. The question remained whose proposals Roskosmos would bring to the negotiation table with the Europeans -- RKK Energia's winged glider and its derivatives or Khrunichev's capsules. As it turned out, the new concept involved a radical upgrade of the Soyuz spacecraft within the Advanced Crew Transportation System, ACTS project. ESA formally approved the concept in June 2006. In September 2006, Russian, French and German leaders held a summit in France, which dealt among other things with Russia's controversial bid to purchase a stake in Europe's aerospace giant EADS. Space cooperation apparently came up as well, as Putin emerged from the meeting with the Europeans, with assurances that France and Germany were interested in cooperative work with Russia on the next generation spacecraft. However, it was not clear from Putin's statements whether he was talking about the ACTS concept or the Kliper reusable vehicle. 2004: Russia proposes the European Space Agency to cooperate in the development of the Kliper. 2005 February: The Russian-European working group on the Kliper project meets for the first time. RKK Energia presents its proposals on the development of the manned winged version of the Kliper. At the time, Europe is only interested in the reusable cargo vehicle, to replace the ATV spacecraft. Both would be launched by the Ariane 5 rocket. 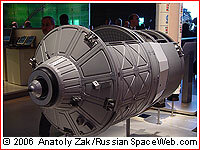 2005 April: The new meeting between Russian and European officials took place where ESA expressed interest in the manned orbiter, leaving a cargo version as an extra option. 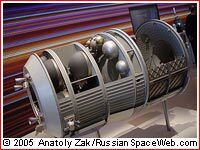 2005 June 10: The head of manned space program of the European Space Agency, ESA, conducts talks with Russian space officials in Moscow on the possible cooperation in the development of the Kliper. 2005 June 13-19: Roskosmos displays a scaled model of the Kliper spacecraft at the Paris Air Show in Le Bourget, conducts negotiations with European Space Agency and the industry on possible cooperation in the development of the spacecraft. 2005 October: Top officials from RKK Energia visit Japan to explore the possibilities for cooperation on the Kliper project. 2005 December: European officials reject a proposal for ESA's involvement in the development of the Kliper. 2006 May 16-21: At Berlin Air Show, ILA2006, Head of Roskosmos Anatoly Perminov discussed with European space officials possible cooperation in the development of a spacecraft for the flights to the Moon. 2006 June 21-22: ESA’s ruling council, which met at the agency’s headquarters in Paris, France, on June 21 and 22, 2006 made a decision to embark on a two-year study in cooperation with Russia on possible development of spacecraft capable of reaching lunar orbit. The program was designated the Advanced Crew Transportation System, ACTS. 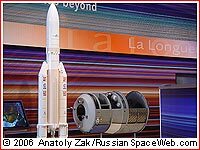 2006 Sept. 23: In the wake of the Russian-German-French summit, President Putin said that Russia hopes to develop a "new spacecraft" in cooperation with France and Germany. "France and Germany confirmed their interest in cooperative development of a modern new-generation "shuttle" for transport and passenger purposes," Putin said as quoted by Russia's official ITAR TASS news agency.